The LRA is an array of mirrors that provide a target for laser tracking measurements from the ground. By analyzing the round-trip time of the laser beam, we can locate where the satellite is on its orbit. It is a completely passive reflector designed to reflect laser pulses back to their point of origin on Earth. It is used for the calibration of the Precise Orbit Determination system on the spacecraft. Additional information on the LRA is available on the AVISO site. The Jason-1 LRA is used to calibrate the other location systems on the satellite with a very high degree of precision. It is a totally passive reflector designed to reflect laser pulses back to their point of origin on Earth. 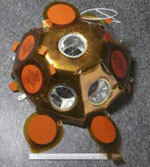 It consists of nine suprasil quartz retroreflectors arranged to provide a near-hemispherical response. The LRA allows the Jason-1 spacecraft to be tracked with centimeter accuracy by approximately 10-20 satellite laser ranging (SLR) stations which make up the International Laser Ranging Service (ILRS). The small number of ground stations and the sensitivity of laser beams to weather conditions make it impossible to track the satellite continuously. That is why other onboard location systems are needed. The TOPEX/Poseidon LRA, was a set of 192 quartz corner-cubes mounted in two concentric rings around the altimeter antenna. The array is a completely passive unit which reflects laser beams originating from one of about thirty ground-based laser tracking stations positioned around the earth. By measuring the length of time the laser beam takes to travel to the spacecraft and back, scientists were able to calculate TOPEX/Poseidon's orbital radial position to within 3 centimeters.